I picked up this beautiful woodgrain background stamp in Seattle a few months ago (and it finally saw some ink! ), so technically, this works for this week's A Muse Lounge challenge!! Wow, I am proud of myself for doing something that works for a challenge!! I have lots of other ideas brewing for this beauty! And I know - a pink owl?? Just seemed like it worked! Do you see that ribbon? It started off white, and I colored it with my dark pink Copic marker! Love that!! 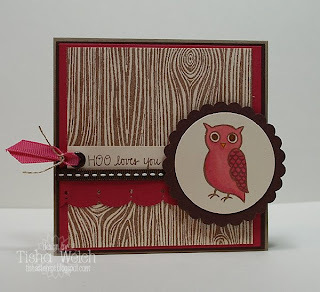 Stamps: Woodgrain background (by somebody - I can't remember right now! ), Owl from the A Muse clear Nature set, Hoo loves you? 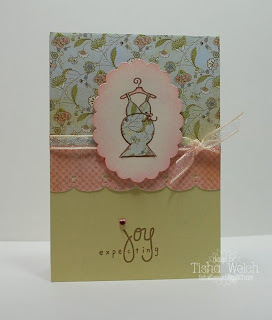 ***ETA: Okay, I went back and reread the challenge, and it's supposed to be new A Muse stamps (duh!). Oh well, I just don't have it in my to retype the whole post. Don't you think it should count since I bought the stamp with A Muse girls??? Oh my ... somebody should spank me! No ... not like that! Get your minds out of the gutter! Somebody should spank me for being such a bad blogger! Okay - that's it ... no more flogging myself! Things have been crazy, which at some point I am going to have to admit is just the norm! I have missed blogging, and I have had way too little time to get crafty! I am trying to get back in the groove, and hopefully things will be better!! In other news - have you checked out the newest A Muse release?? OMG - the Sweet Shop is just amazing! There is going to be a lot of Valentine's love being shared with these fun new stamps!! If you haven't gotten yours, be sure to order soon - or get yourself to your local retailer and pick some up! Have you checked out the new A Muse Lounge??!!?? It is a beautiful, amazing place to get together with all the A Muse gals, meet new friends, and chat about all sorts of things! There is also an awesome Gallery with some great ideas to inspire you!! Be sure to check it out!! One of my dear friends is expecting a baby, and this sentiment is just perfect! I've been sorting and rearranging some of my stuff, and I ran across my 6x6 pad of Basic Gray Lily Kate paper. I just love it, and I tend to hoard things that I love, but I am trying to make myself use the stuff I have! What good is pretty paper if it just sits in my craft room? ?